This was my first capacitor. It is constructed of (24) Miller Genuine Draft Bottles filled to the neck with brine. 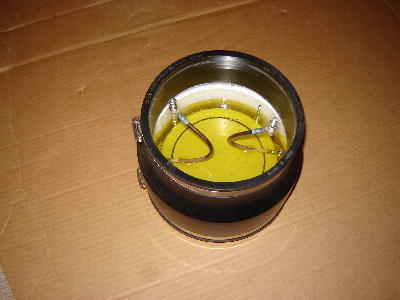 The neck is filled with oil and a carriage bolt inserted down through the oil and into the brine. The carriage bolts are tied together by the brass strips seen in the picture to form the cathode. Each bottle is wrapped in tin foil and plastic up to the neck. 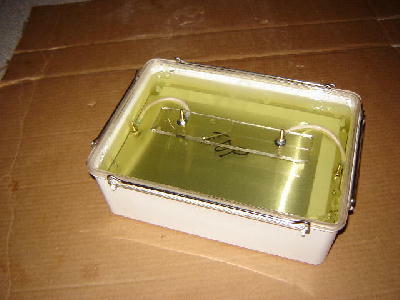 The foil is formed around the bottom of each bottle and sits on a brass sheet plate in the bottom of the box to form the anode. 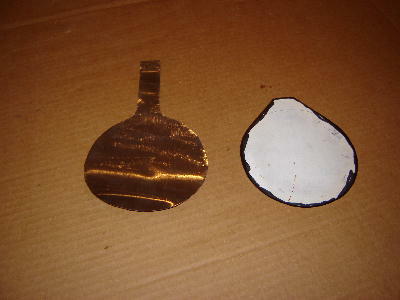 A glass sheet under the brass plate provides insulation. Each bottle provides about .75 nF capacitance and the entire box about 18 nF. 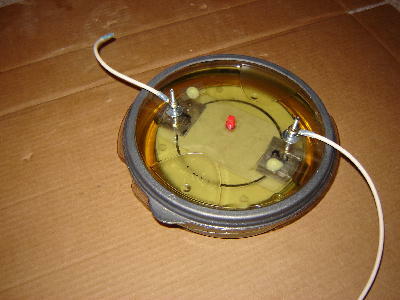 It worked great my original Tesla Coil 2003. This was my first parallel plate capacitor. It is constructed of 30 dielectric layers of (3) polyester sheets(per layer). Each layer provides .602 nF capacitance and the complete unit 18 nF. The conductors were made from .010" aluminum flashing and cut 5" dia with a 1" strip extending out one side to wrap around and connect with the other conductors of the same polarity. A picture of an individual conductor can be seen below. The unit was constructed under oil to insure no air bubbles were present between the layers. The round design was chosen to avoid HV break-out at corners. The polyester sheets are 6-3/4" dia to prevent break-out between layers. This cap was a dramatic improvement over the salt water cap in terms of spark length. This cap was similar to the 1st generation with two improvements. First, it was built in a 6" PVC pipe cap with a rubber boot(pipe adapter) and polycarbonate cover. Second, the conductors were bolted together with brass spacers between them to make up for the thickness of the dielectric. Both of these changes were made in preparation to build a much higher value capacitor. A picture of the conductor template can be seen below. Again, capacitance was about 18 nF. This design mehtodology was abandoned for two reasons. The small conductor area meant we needed more that 60 layers to reach 40 nF and the labor hours required to cut out the dielectric and conductor layers was very high. On the left is the conductor for the 1st generation and on the right a template for the 2nd generation. The hole for the bolt is located in the center of the tab located at the top of the template. This unit was developed to provide high capacitance with a minimum number of layers. 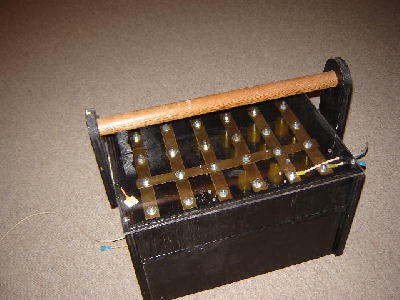 It is assembled in a Click-Clack storage box. It has 24 dielectric layers of (6) polyester sheets per layer. The conductors are .010" aluminum flashing. It uses a bolted design with brass spacers between each condcutor layer to compensate for the thickness of the dielectric. Each layer provides 1.6 nF capcitance for a total of 38.5 nF. Because of its rectangular design, both the dielectric and conductors could be sheared on a paper cutter. This allowed all of the sheets to be cut in less than an hour(note 24 X 6 = 144 sheets of polyester). The corners of the conductors did have to be sanded to prevent corona from forming. This cap worked great and handled 17kv without difficulty. Here is my MMC. It is constructed of (4) strings of (12) CDE 942C20P15K(.15 MFD - 2000 VDC) capacitors. Each string of (12) provides 12.5 nF capacitance for a total of 50 nF. Each individual cap has (2) 10 mOhm bleeder resistors in series across its leads. The individual caps are mounted on a PC board and alternate from top of the board to bottom and back as one progresses down the string. (3) strings fit on one board and can be selected for use as needed by wiring. Interestingly, I found a negligible improvement from my 3rd generation parallel plate cap and (3) string(37.5 nF) MMC. Obviously, the MMC can handled higher voltages. The parallel plate caps were typically built from scrap materials(the containers were the highest cost) for under $30. At $3 per CDE cap, the MMC was well over $150. I had these boards made to make it easy to mount the MMC caps and resistors. 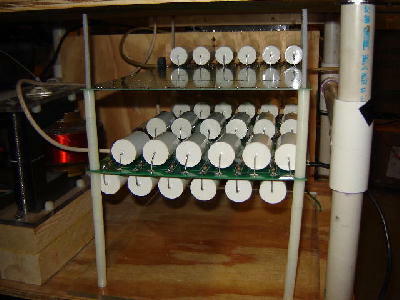 The large whire rectangles represent the caps and the small ones the resistors. Count (6) caps per string on each side of the board for a total of (12) per string. As you can see, (3) strings fit on one board. 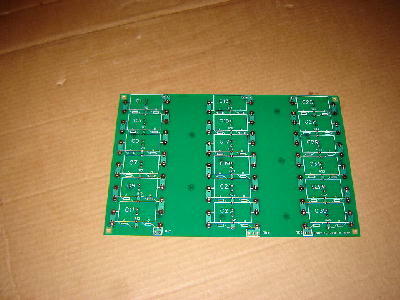 I made some extra boards so if you like this concept and want to use it, contact me and I can provide some boards.